Home / 2012 / June / 19 / Colombian church leaders visit Washington D.C.
Colombian church leaders visit Washington D.C.
CEDECOL delegation in front of the Capitol. From left to right: Pablo Moreno, Pedro Acosta, Michael Joseph, Barbara Gerlach of UCC, Jenny Neme, Theo Sitther of MCC, Mary Luz Correa, and Sonia Hsiung of MCC (Photo MCC/Jesse Epp-Fransen). 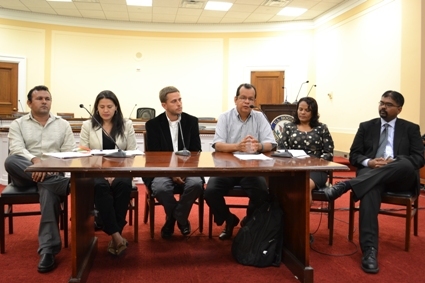 On June 14th and 15th, MCC Washington Office had the pleasure of hosting a delegation of leaders from the Peace Commission of the Evangelical Council of Colombia (CEDECOL). CEDECOL represents around 70% of the Protestant, evangelical, and Anabaptist churches in Colombia. For over 60 years, the Commission has been active in the work of peace, justice, and human rights in the midst of the violence in Colombia. They also document cases of human rights violations against Protestant and evangelical churches in an annual report, A Prophetic Call. 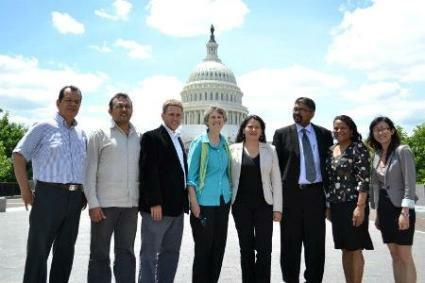 The delegation had an extremely busy but fruitful two days in D.C. They visited Senate offices, met with State Department officials, spoke at an ecumenical lunch, held a house briefing, and even fitted in a tour of the Martin Luther King Jr. Memorial! At each place, the delegation discussed the violence, human rights violations, displacements, threats, forced disappearances and assassinations faced by the communities they work with. U.S. military aid to Colombia has been detrimental. CEDECOL would like to see an end to military aid, as well as the attachment of strong human rights conditions to existing aid. The churches in Colombia support a negotiated end to violence and conflict. As such, Protestant and evangelical churches want to participate in a peace process as a member of Colombia’s civil society. Any dialogue or peace negotiations with armed groups is currently limited only to the President of Colombia and the hierarchy of the Catholic church. For more information about CEDECOL and short biographies of the delegation that was here, see this document.